How to Recover Deleted Music from Google Nexus? Home > Resources > Others > How to Recover Deleted Music from Google Nexus? Equipped with Android OS and featured with wonderful touch screen, Google Nexus is becoming one of the most popular device for Android fans. If you have got a new Nexus phone, you must be eager to save massive music files on the device for enjoyment on the go. But what if your favorite songs were lost without backup? Don't worry, you can effortlessly get them back before new data overwrite your lost music files. 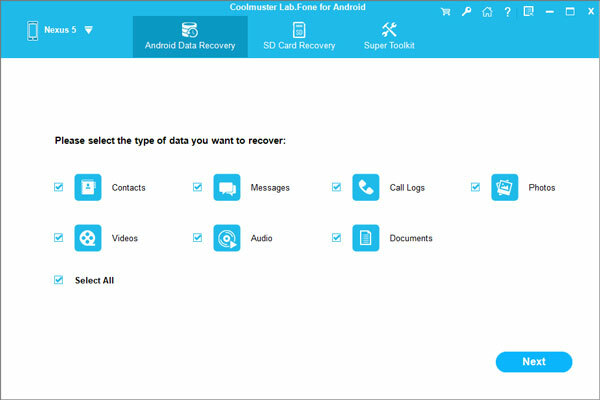 Coolmuster Lab.Fone for Android is right here to rescue your lost Nexus music files. It is specially designed to restore your music files lost due to accident deletion, corruption, device formatting and other unknown reasons from your Google Nexus 6/5/4/3. 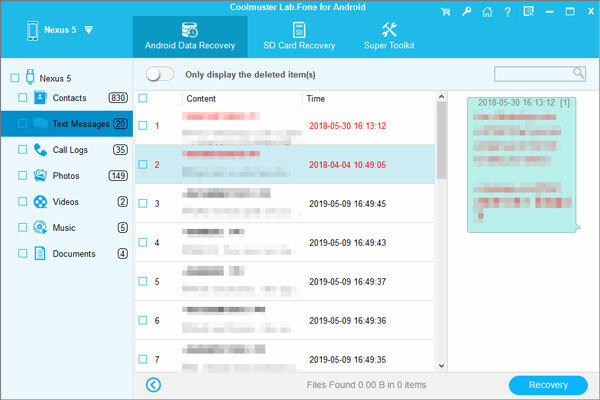 In addition to music files, this Android data recovery also be able to recover videos, photos, documents, contacts and text messages from other more Android phones and tablet. Want to retrieve your lost and deleted songs on Google Nexus device immediately? Now go and have a try. Be sure to download the right version of the Lab.Fone for Android based on your computer system. (1) For Android 2.3 or earlier: Enter "Settings" < Click "Applications" < Click "Development" < Check "USB debugging"
(2) For Android 3.0 to 4.1: Enter "Settings" < Click "Developer options" < Check "USB debugging"
(3) For Android 4.2 or newer: Enter "Settings" < Click "About Phone" < Tap "Build number" for several times until getting a note "You are under developer mode" < Back to "Settings" < Click "Developer options" < Check "USB debugging"
Lab.Fone for Android will scan your Google Nexus once the USB debugging is enabled. All your data in the Google Nexus can be scanned out. You can choose the "Music" folder to find the music files you have deleted. You can preview these music files one by one and only tick those you want to recover. After that, click on the "Recover" button from the top line to begin the music recovery process for your Google Nexus. The tool is also can be used to restore data from other Android devices like Samsung, Sony, LG, HTC, Motorola, etc.